After baking the Creme Egg cupcakes a few weeks ago, I decided that I really wanted to get in the kitchen more and bake some new things, as I really enjoy it (as do my family, who get to eat the results!) So, I’m making myself a list of things I’d like to bake, and am slowly making my way through it. 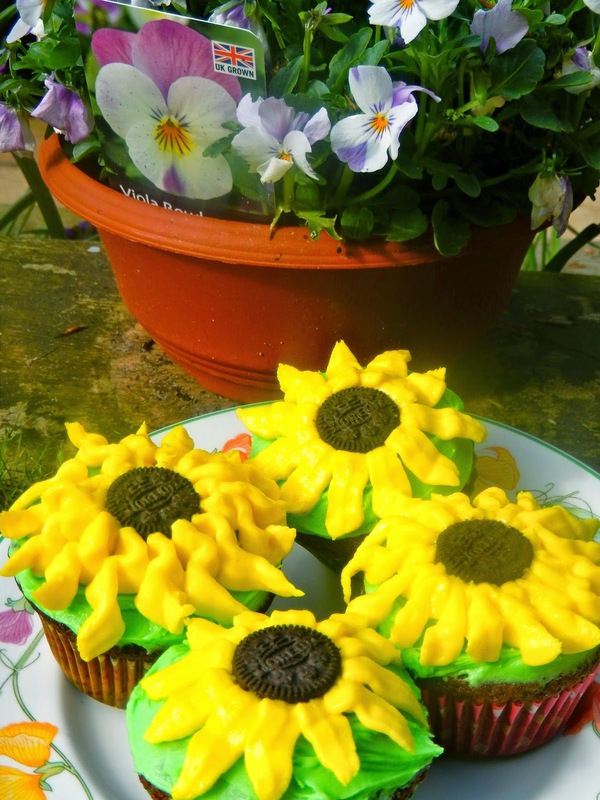 With it being Spring, I thought the perfect thing to bake was these Oreo Sunflower cupcakes. I adapted a recipe from Sweethearts Cakes and Bakes, although I managed to get a bit confused and doubled the recipe, leaving us with rather a lot of cupcakes! I will give you the original measurements so you’re not overwhelmed by cake. Our doubled amounts made 44 cupcakes, so this should make around 22. Preheat the oven to 180C and line a cupcake tray with cases. Place a whole large Oreo at the bottom of each case. Sieve the flour, cocoa, baking powder and a pinch of salt into a bowl and mix. In a separate bowl beat the butter and sugar together until light and fluffy and add the vanilla extract. Crack the eggs into a separate bowl and whisk, before adding to the butter and sugar mixture. Alternately add the milk and flour, bringing it all together until all the ingredients have been combined. Divide the mixture between the cupcake cases; making sure the Oreo at the bottom has been covered. Bake in the oven for 18-20 minutes. The cakes are ready when a skewer comes out clean. Set the cakes on a cooling rack and leave until completely cooled. To make the frosting, beat the butter and icing sugar together, adding the vanilla, until the mixture is smooth and fluffy. Add the milk a little at a time until the mixture is a good consistency. For this particular project, it needs to be relatively stiff for the petals to hold their shape. Split your mixture in half, colouring one half with the green gel and the other with the yellow gel. Cover the cakes with a thin layer of the green frosting; ensuring the cake is completely covered. Place a mini Oreo in the centre of the cupcake, then, using a piping bag and suitable nozzle, pip the petals on around the Oreo. It can help to have a second person turning the cake as you do this. Have you made Oreo cupcakes before? Or do you have another recipe you’d like to share with me? What a clever idea, they look fabulous!